I am so excited to have been tagged for The Next Big Thing Blog Hop! Thank you for tagging me Teal! I hope I can live up to the hype! Hahaha. All right, let’s rock this joint. MD: I dreamt it. It was one of those rare occasions when I remembered my entire dream. It was great. I had just been on this wild ride, in my sleep, and when I awoke from the humongous twist at the end of the dream, I sat up in bed and wrote it down. It was a great morning. 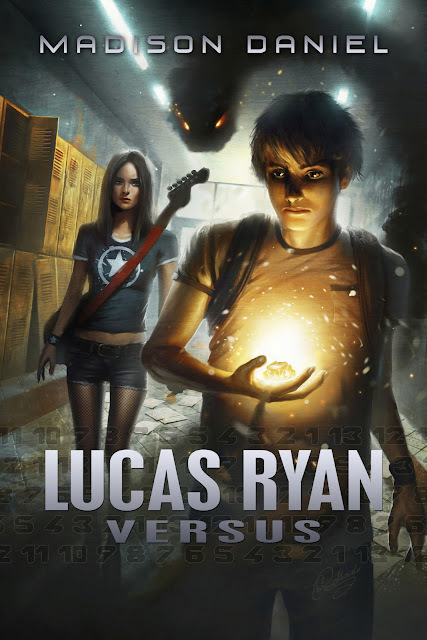 Lucas Ryan Versus is my first true science fiction story. It’s fun, exciting and full of twists. I can’t wait to show everyone! MD: I’m not sure yet. I’ve really tried not to cast the main characters this time. (that’s a first for me!) AND I am a big believer in “unknowns” playing the parts of your favorite book characters. I am anxious to see who the readers think will make a good Lucas. MD: A day in the life of the world’s newest hero; video games, homework, high school, bullies, detention, crushes, secrets, other dimensions, monsters, super powers...the end of the world. MD: I’m planning on self-publishing it in May, but I might option it to an agency too. Once the final edit is finished, I’ll get that figured out for certain. MD: About 2-3 months. Not too long. MD: My love for adventure and science fiction movies/television series. MD: It’s the first in a series of books that I hope will continue on and on. I do not plan an end to the series, just keep going until I cannot write anymore. There is also a musical playlist wrapped inside, like most of my work. I adore you. This you know. Xoxo.